Did Tom Cruise Really Do All the Stunts in 'Mission: Impossible - Fallout'? At this point in his career, the stories of Tom Cruise doing his own stunts are almost legendary. The building jump gone wrong for his latest film “Mission: Impossible – Fallout” — the take of which ended up in the final film — has been a favorite on this press tour. But truth be told, that stunt, during which Cruise broke his ankle, isn’t even the most daring in the film. Cruise told Jimmy Fallon during an appearance on “The Tonight Show” that jumping from one building to the next was suppose to be an easy one. In “Mission: Impossible – Fallout,” which currently has a 98 percent rating on review aggregator Rotten Tomatoes, Cruise’s IMF agent Ethan Hunt is caught in multiple chases (including one in a helicopter), free-climbs a cliff (again), does a HALO jump (high altitude; low open) out of a plane at 25,000 feet, and he runs. A lot. And yes, at 56 years old, and after 22 years of “Mission: Impossible” movies, Tom Cruise still takes danger in his hands. “Tom always does his own stunts and never has a double,” a person close to the film told TheWrap. 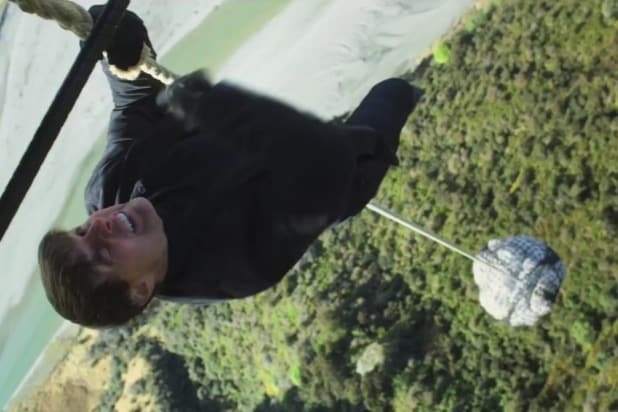 Watching Cruise’s Ethan Hunt hanging from and climbing a rope attached to a helicopter thousands of feet in the air, it might be hard to believe that it’s actually the actor pulling himself up of his own accord… but it’s him all right. During an exhilarating chase in which Hunt rides a motorcycle through the streets of Paris and then against traffic around the Arc de Triomphe, that’s actually Cruise on the bike, and with no helmet mind you. And, of course, what would a Tom Cruise film be without running (“Tropic Thunder,” maybe?). Cruise, as always, does all of his own running in “Mission: Impossible – Fallout,” and, boy, is there a lot of it. The amount of running in the film is a stunt unto itself and director Christopher McQuarrie shows off Cruise doing it all himself, with long shots, and in other action sequences, with clever uses of the camera. No matter what the situation, Tom Cruise is committed to making his movies feel as realistic as possible. But sometimes, it feels like he takes it a little bit too far, to the point that his "Mission: Impossible" co-star Simon Pegg says that the biggest difference between watching him do the stunts on set and watching them in the film is that the audience "knows that Tom lives in the end." Here are some of the ways Cruise has risked life and limb for his craft. After eight months of rigorous martial arts and katana training, Cruise climbed aboard a mechanical horse for a makeshift battlefield joust against co-star Hiroyuki Sanada. But an error in Sanada's mechanical horse caused it to stop farther than the crew intended, and Cruise's neck nearly collided with Sanada's sword. Decapitation? Who's to say. But would Cruise have broken his neck if that sword got any closer? Quite likely. In one armrest-clutching shot, Ethan Hunt stops a knife from being driven right into his eye. When it was filmed, Cruise shocked director John Woo when he said he wanted to be involved in the shot with no special effects. Like "The Last Samurai," the blade is dulled, but it's attached to a cable to make sure that Cruise didn't need that "Valkyrie" eyepatch eight years in advance. "MI2" also had one of Cruise's most famous scenes: the opening of the film where Ethan climbs up a cliff with no gear. 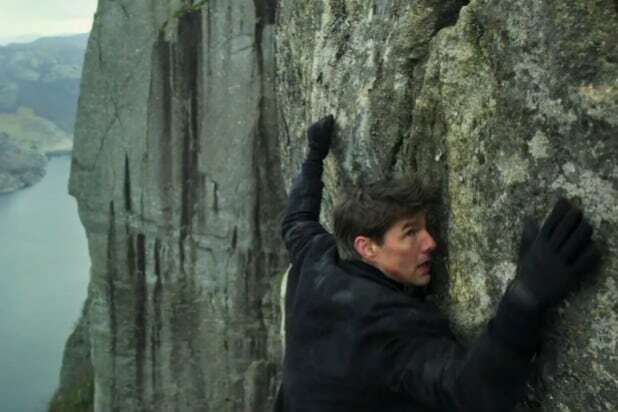 But while Cruise did have digitally removed gear he used during filming, he did tear a muscle in his shoulder while filming the scene, which included a shot of him clinging to the sheer rock face while facing outward over the huge drop below. An instantly iconic action scene for both Cruise and the genre as a whole was Ethan's infamous attempt to scale the Burj Khalifa. While Cruise was harnessed, he climbed, dropped, and swung around the side of the half-mile high skyscraper for eight days to get the shots seen in the film. Before working together on "Mission: Impossible," Cruise and director Christopher McQuarrie worked on this action film in which Cruise did all the car chase scenes on his own. Yes, even the parts where he's smashing into walls and other cars. Cruise went on to use his stunt driving training to power slide through narrow alleys in "Mission: Impossible -- Rogue Nation" while cameras attached to the windshield make it nearly impossible to see the road. That's not a green screen. While Cruise is attached by a safety harness that's digitally removed, he really is clinging to the side of a plane as it takes off. Cruise has said that between the g-forces of the takeoff and the wind blasting in his face, he nearly forgot to say his line while holding on to the plane. 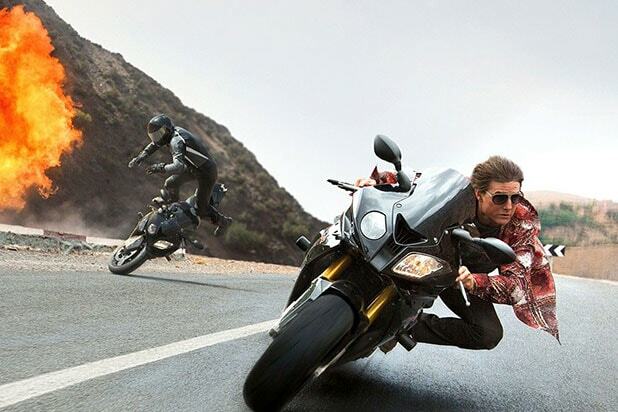 Now, in the latest "Mission: Impossible" film, Cruise goes from car chases to helicopter chases. In an interview with Graham Norton, Cruise says he spent two years getting his helicopter license and preparing for the scene, which involves a close range, low altitude chase through the mountains of New Zealand with co-star Henry Cavill. "There was a point where I genuinely thought... 'At least I get killed by Tom Cruise. That'll look good in the papers,'" Cavill said. And that's not the only death-defying stunt he does in the film. At CinemaCon in Las Vegas, Cruise explained how he jumped 25,000 feet out of a plane over 100 times for another aerial stunt sequence while wearing military breathing equipment that allowed him to skydive at such high altitudes.